Whatever the instructions to the Ministers and the appointment of PAs, Modi govt. seems to be facing the first crisis well - that of inflation. The quadruple factors of Iraq crisis, expensive Brent crude oil, rising price of vegetables and the bad May WPI data seems to have attracted the govt. 's attention. Now that they are concentrating on controlling inflation, I would say that they got their priorities right. Lower inflation will go a long way in enabling the RBI to reduce interest rates, which will give a boost to bank loans and businesses. It is still early days for economic policies, but the actions are in the right direction. Same for Security. But the pain area seems to be in the education side. The latest controversy on 4 year program is the case. Now, nobody is forcing students to join the 4 year program. If the UGC did not like the 4 year program, it could have suspended funding only for that, rather than a blanket freeze, which is basically flexing muscles. The government on Saturday took a step forward on fuel pricing by approving a 33 per cent jump in natural gas prices to $5.61 per mBtu and by decontrolling the price of diesel. This is the first reduction in diesel rates in about five years. Diesel rates were last cut on January 29, 2009, by Rs 2 a litre to Rs 30.86. 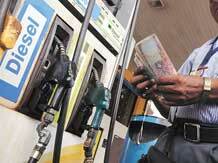 Diesel prices were last raised by 50 paise on September 1. At least some one now has supported one part of it. Cannabis, now that may be one thing all of Indian's intelligentsia will support. Taare adadhi rate piwaa javu chhe? Aapde tya Gujarat ma to malej chhe jyaare joiye tyaare. You are right 100% - Gujrat is home to males. Not all the way, but a bit towards #6 is happening.